With the Holidays upon us and the folks like me who are last-minute shoppers, we want to snag the right deals at the right price. There is only so much information we can get out of company's websites and emails boasting about their biggest sales on Black Friday. The best way to overcome the anxiety of digging for deals and raging over misleading offers can be found in the palm of your hand. There are two apps that are currently offered that can help you to unlock that achievement. 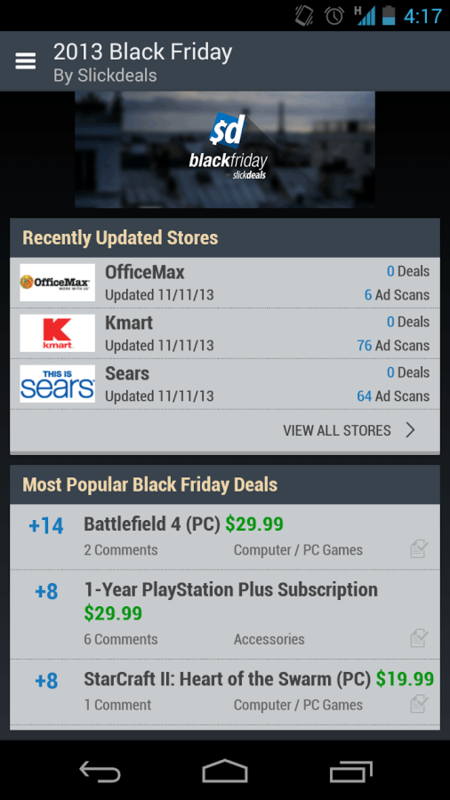 The first app I would like to cover is the Black Friday App from SlickDeals, not to be confused with their original SlickDeals app. With the Black Friday version, you get all the details and updates you need to start saving money; Starting with this free download on Google Play. SlickDeals brings you notifications so you can get updates right away when new deals are released or even leaked. There is offline Support so you can use the app out and about, even when you don't have a data connection. Just download the data ahead of time and access those deals anytime you want. Browse sites like Amazon, Best Buy, Wal-Mart and more for the best Black Friday deals. Want a little organization in your life? No problem, just sort the list by where you live, by category, build shopping lists and figure out how much you're spending by using the in-app calculator. If that's not enough you can also send out some hints or spoiler alerts to friends and family by sharing shopping lists. So what are you waiting for, head over to the Play Store and see SlickDeals for yourself! The Play Store has yet another application that can help you out. Just like SlickDeals' Black Friday app, FatWallet Application will assist you in your holiday shopping needs. Packed with all the same features like searching for deals by store, category, brand and price. FatWallet has a check out so you can purchase in-app if need be. Head on over and check out FatWallet at the Play Store download it for free today. On a final note; Both SlickDeals and FatWallet's Black Friday apps are great products to help you by avoiding lines, dealing with the midnight madness and finding the right deals with out the gotchas of misleading advertising. To me, I feel that SlickDeals stands by its name, offering more deals along with more active users but, on the other hand each app may offer different deals. With that being said, let chaos of holiday shopping reign in the palm of your hand! Let me know what you think about both of these applications and which one seems to be more on point with your holiday shopping standards. Until then I wish you all a happy holiday and please, for those celebrating Christmas (I'm taking to you radio personalities) let's lay off the music until after Thanksgiving.. Please!? What's up Android Headline readers? I am an avid user of everything Google, especially Android. My field of study and work is in the IT realm, so I'm always looking to the cutting edge and what's new. As a news reporter for AH, I plan on bringing that knowledge to you, the reader.